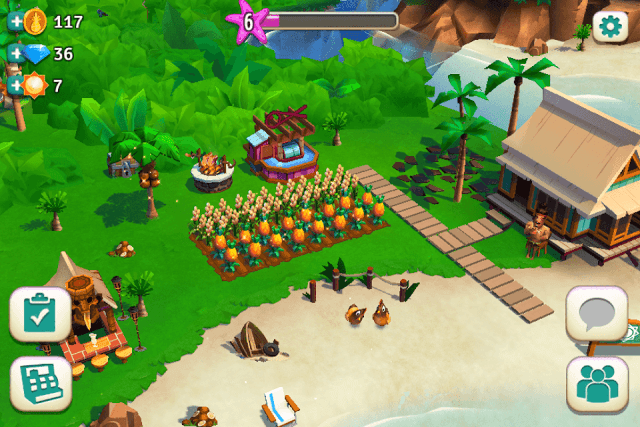 Zynga’s Farmville: Tropic Escape is more than just a farming simulation social network game. The game not only lets you build a farm, but also lets you expand your business by building an inn on a remote Pacific island. You will construct different types of workshops that will help you prepare sumptuous recipes for your guests, team up with various guides that will help you complete tasks and explore uncharted areas of the island, tame exotic animals for fish, meat, milk and eggs and play fun mini games. Keep growing crops and harvest them to increase their quantity. So if you have only one pineapple, don’t fret. Just plant and harvest it. Now you will have two pineapples. Drag both pineapples to the fields and the count increases to 4. Drag all 4 pineapples to the field and harvest them to get 8 pineapples. Well, that’s the power of compounding. Want to grow more crops. Add more patches of land to your field. It’s available in Shop under “Fields and Trees”. You will also find a variety of trees that provide fruits/rubber/beans at regular intervals. The stuff you get from trees can be used to prepare dishes. Besides getting the required products from trees, you will also receive XP. Growing crops, acquiring products from trees, fishing etc. will grant you extra XP. Don’t keep fields empty. Harvest and stock pineapples/rice up at the Silo storage. Foods that you grow on the field play an essential role in crafting recipes. Without them you cannot prepare basic and advanced recipes. You can say they form the base of most recipes. To prepare Fried Rice, you will need Eggs, Steamed Rice and Pineapple. But first you will need rice to prepare steamed rice. Plus you will have to feed rice to chickens so that they can lay eggs. So you see rice plays a key role in preparing “Fried Rice” in more than one way. Is your Silo Storage full? Well you can upgrade it to increase its capacity. But you will need materials to upgrade it and they are NOT easy to get. Until then, you can use some of the stored ingredients to prepare dishes and supply them to guests for coins and XP. example: Pineapple smoothie, Pina Colada, Daiquiri and Steamed Rice). Prepare those and “Deliver” them to get extra bucks and XP (Pink Starfish). This way, you can always have some space left in Silo Storage. The Silo usually contains crops whereas Boathouse contains prepared dishes and materials. If you want to expand Silo and Boathouse storage, then start collecting items like planks, ropes, anchors, nails etc., fill the requirement list for each storage building and increase their storage capacity. Now these items can be found at the Coral reef, Merchant Shipwreck and other island landmarks. Send your guides to hunt for chests in such landmarks. Chests may contain materials. But chances of getting chests are usually lower. To increase your chances, unlock more guides and send the best ones to different landmarks. Before sending guides, make sure you have the required “Supplies”. 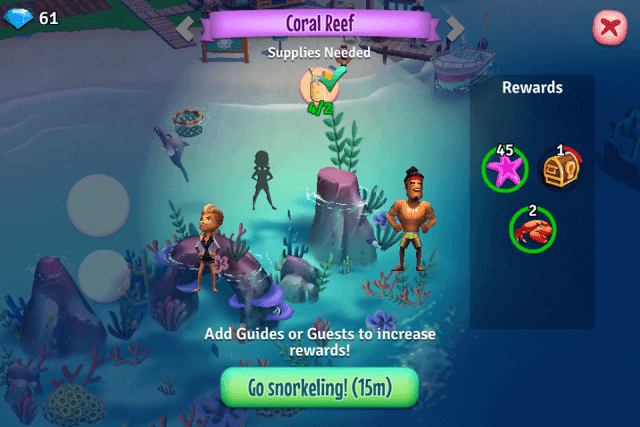 For example: You can send guides to the coral reef only when you have the required number of Pineapple smoothies. You can also get building upgrade materials every time you level up. Take as many guest orders as possible to get plenty of XP and level up faster to get upgrade items. Mallets, Pickaxes, Shovels etc. will help you fix buildings or remove objects. Repairing and removing certain items can get you extra rewards like coins and XP. Mallet can be used to fix dilapidated buildings and structures. The Pickaxe can be quite useful in uprooting shrubs and plants. So if you want to add another patch of land to your field to grow more crops, but can’t do because a pesky shrub is acting as an obstruction, just use the pickaxe to get rid of it and in return you may get come coins and XP. The shovel can be used to remove waste trunks of a tree. You might get a pickaxe, shovel or mallet by completing guest orders. So keep preparing delicious dishes and serve guests to get them. Multitasking is the best way to earn more coins, XP and complete special, limited time clipboard tasks faster. Tap the clipboard icon at the bottom left corner of the screen to get a checklist provided by each guide. Start preparing dishes demanded by your guide. Now check the Guest Orders board at the pier and see if the same dishes are being ordered or not. You can sell the same checklist dishes to guests to earn extra bucks and XP. This way you can complete both tasks and guest orders to get more rewards. Selling dishes that were prepared to complete tasks won’t have any effect on your checklist goals. So if you made 4/5 seared fish and then sold 2-3 Seared Fish to guests as part of their order package, the checklist will still read it as 4/5 and no dishes will be deducted from it. However, try not to sell those that are required to complete a checklist task. If you have caught 6 fish and a checklist task asks you to make 3 Fish rolls and if one of guest orders demands 5 fish, then don’t fulfill the guest order demand first as the fish sold via guest order will be deducted from your catch and you will again have to feed pineapples to the cute dolphin to get fish. 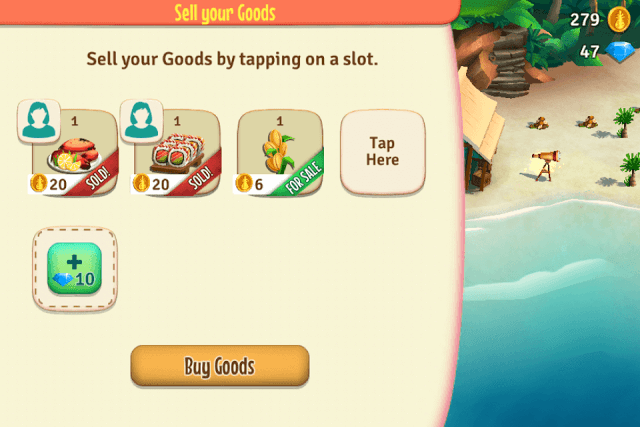 Fulfilling guest orders by dispatching delicious dishes is probably the best way to earn lots of coins in FarmVille: Tropic Escape, but have you tried selling the same dishes at the online marketplace. You can earn a lot more. 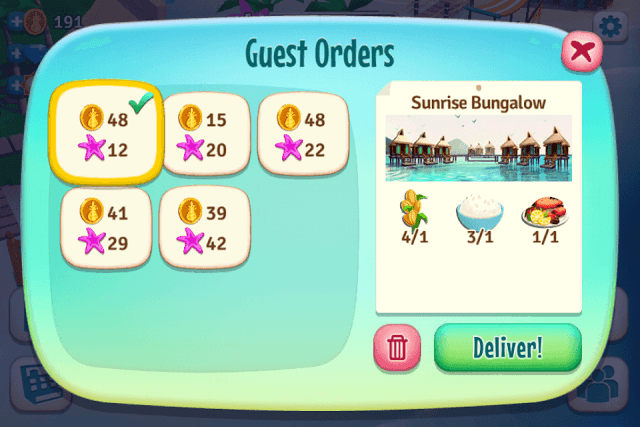 You can set a higher price for the dishes instead of receiving a fixed amount of coins from guest orders. Tap the boat located near the Boathouse storage building to access the marketplace and then press an empty slot. I once put up Fish roll and set the price to 20 coins, which was way more than the price I got for dispatching the same dish via Guest orders. Within 15 minutes it was purchased by a random player. Dishes that require more ingredients and time to complete will be in demand. Crab rolls, Fried Rice, Fish rolls etc. are a few examples of high-demand dishes. Set their price high, but not too high. When you tap a slot to add a dish, you can see its base price. Example: Fish Rolls’ base price is 12. You can sell it for 15 or 18 and some player who is desperate to complete a checklist task will buy it immediately. Try to sell extra dishes or those that are not required towards completing a checklist. Save gems and use them to add more slots to buildings and the marketplace. With an extra slot added to the grill or the Tiki bar, recipes can be queued up. This will make is easy for you to arrange dishes based on the task list. So if the checklist demands 1 Fish Roll and 1 Crab Roll, and if you have enough ingredients to make both of them, you can add both recipes to the empty slots and continue working on other tasks while the Sushi Stand prepares both dishes one by one. Tap the discotheque to know about the ongoing island event. Many events offer extra benefits to players. For example, one of the first events right after unlocking the discotheque was “Mating Season”. In this event, all animals produced one extra output. A dolphin will provide 3 fish, chickens will provide 2 eggs etc. Events are limited-time offers, so make the most of them. Use sunshine on animals, crops and trees to instantly collect resources from them. The good thing that sunshine can be borrowed from friends and you don’t need to spend real money to get them. Tap the sunshine button to your left and then tap the green “Ask Friends” button. But before that make sure you connect to them on Facebook via the app to exchange gifts. You will instantly earn 5 gems after connecting to Facebook. I have been playing for several months now. And while I enjoy the basic gameplay I am getting severely frustrated with the glitches. I have 80 sand dollars and not a single silver one. And when I finally get one the same animal comes out so I can’t complete the tasks. I often find I can’t travel to help out on the team member sites. And 4 times now my daily gift reward glitches out and took me back to zero days when I was up past 15 days. Bummer! Although it’s fun, there’s not much you can do with the game without spending huge amounts of money . It should be much easier and less stressful if gems were available without spending so much money . Honestly it’s sad these games ask for money like that . Most can’t afford it .